Emerging agent-based systems offer new means of effectively addressing complex decision processes and enabling solutions to business requirements associated with virtual organizations. Intelligent agents can provide more flexible intelligence/expertise and help the smooth integration of a variety of system types (i.e., Internet applications, customer relationship management, supplier network management, enterprise resources management, expert systems). This chapter presents an overview of expert systems as the most widely-used approach for domain Knowledge Management today as well as agent technology, and shows the latter as a superior systems development vehicle providing flexible intelligence/expertise and the integration of a variety of system types. To illustrate, a system developed first by using an expert system approach and then by an agent-based approach is used to identify the strengths and weaknesses of the agent-based approach. Last, the practical implications of a company adoption of agent-based technology for systems development are addressed. As we enter the 21st century, organizations are faced with extremely difficult challenges in a hyper-competitive world. As posited by Khalil and Wang (2002), to remain competitive they must simultaneously be efficient on a global scale, be responsive to local needs and wants, and continuously learn and adapt to changes in their environment. To accomplish such daunting requirements, organizations must focus on what they do best and find reliable partners to do the rest. 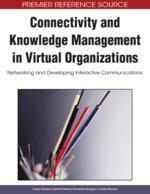 Thus, Donlon (1997) stated that being virtual is about having allies to bolster an organization’s weaknesses. According to Carlsson (2002), there are a number of reasons for the emergence of the virtual organization, including: (1) to make products and services available at the moment of need, at the right place, tailored and built according to quality standards, and at a competitive price; (2) to enable customers to help design and produce their own products; and (3) to enable suppliers to plan and execute their own part of the production process. The most effective way to eliminate the oscillating variations of demand in the supply chain was to build a good interface for the actors of the supply chain to share their planning. Rahman and Bhattachryya (2002) propose that virtual organizations provide an effective vehicle to integrate a company’s operations with those of other enterprises, to work with customers and create a better product or service, to achieve a faster time to market, and to acquire a higher degree of product customization. Further, these authors observed that virtual organizations seem to have five main characteristics in common: (1) They have a shared vision and goal with their partners and a common protocol of cooperation; (2) they cluster activities around their core competencies; (3) they work jointly in teams of core competence groups, to implement their activities in a holistic approach throughout the value chain; (4) they process and distribute information in real-time throughout the entire network, which allows them to make decisions and coordinate actions quickly; and (5) they tend to delegate from the bottom up whenever economies of scale can be achieved, new conditions arise, or a specific competence is required for serving the needs of the whole group. According to Khalil and Wang (2002), the management of a virtual organization involves essential functions that are unique when compared to the traditional management practices: (1) much greater need for mechanisms useful for information filtering and knowledge acquisition to assist managers with information overload, a common problem in the new environment; (2) increased need to generate and use knowledge faster and more effectively; further, organizational knowledge needs to be captured, stored, and made available where it is needed; thus, organizations will have to treat human knowledge as a key component of their asset base, and create knowledge bases or repositories that enable workers to shorten learning curves by sharing each other’s experience; and (3) management has to be based on trust and minimal supervision since it is very difficult to supervise and control in geographically-dispersed units; managers and workers who are comfortable in a traditional workplace may find the new environment difficult to live with.